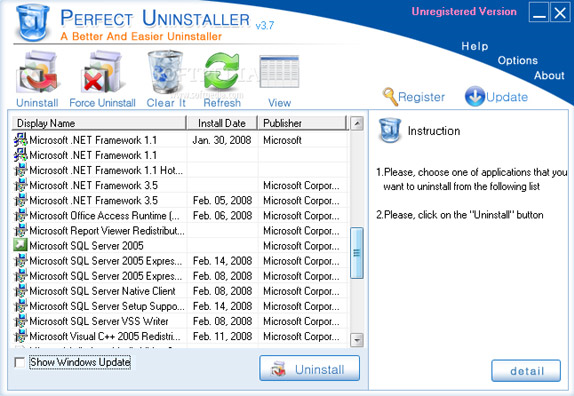 Perfect Uninstaller is a better, easier way for you to completely uninstall any unwanted application, including those stubborn little scalawags that the standard Add/Remove utility can't seem to handle. But that's not all! 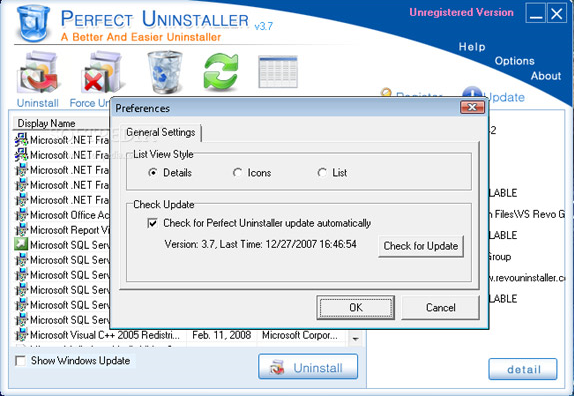 In addition to worry-free application removal, Perfect Uninstaller goes a step further and tidies up the registry, carefully cleaning out all those leftover, extraneous entries that Windows usually leaves behind. It protects your PC from corrupted registry errors and improves performance and speed! 3 times faster than the standard Windows Add/Remove utility. View applications by icon, list, or detail. Easily remove programs that cannot be removed by the Add/Remove utility. Completely clean the empty and corrupted registry entries many uninstalled applications leave behind. Protect your registry from empty or corrupted registry errors and improve your PC performance. Forcibly remove hidden applications installed in your system. Fast point to the folder where an application is installed. Easily navigate the registry entry, installation folder, and website of a selected application. View detailed information of any application installed on your computer. Saundra Anderson Thank you for offering such a good deal. I am going to school on-line and I need a software to remove componets that otherwise affect the progress of my computer. Leroy Jenkins None of the emails on their Contact Us page are valid. All emails sent to them bounce back undelivered. Robert Underhill Simple and easy to use. The best I have ever used. It gets everything out. That's what you want. Nothing is left behind.